Please use AdBlock to view these pages properly. The graphic says it all so far for a very exciting 2019, 12th Annual. 2018: What a party! Celebrating 50 years of Gram’s Sweetheart of the Rodeo and Safe at Home projects. The legendary Earl Poole Ball (Johnny Cash, Gram Parsons, everyone!) with a band I hand picked for him killed. All the bands listed in the poster above nailed it. One more great year for Gram Parsons InterNational! 2017: Our 10th annual was special. April marked Ms. Emmylou Harris’s 70th, and in part in honor of Ms. Harris and her history with Gram, we offered a very special 10th annual in Nashville: “Gram Parsons InterNational 10: Cosmic Ladies In the Legacy of Gram & Emmylou.” All bands were at least female led. AND Cosmic American Productions presented our third annual in SoCal. We had two stages at Don the Beachcomber again, with an exciting list of performers. It was our third huge success there. As most of you know, I book bands that I find to be “in the legacy” of Gram (which 50 years after Sweetheart takes some interpretation and backwards prognostication), so you may not have heard of all of them. Matterafact, I try for that. I believe that fewer than 10% of my audience had heard of Sturgill Simpson or Lydia Loveless when I booked them. I’m extremely excited about some of the bands I’ve booked for our 10th year, and can’t wait to introduce them to you, both in Nashville and Southern California (with great assist from Northern CA). See you there! Four stages, seven bands each, that’s well over 100 players. Thanks to all of you for making 2016 a resounding success. And also to the wonderful audiences that came, you were the best! 2016! What a great year it was for Cosmic American Productions and Gram Parsons’ 70th Birthday Bash! in Nashville (on his birthday, Sat Nov. 5), or Heartland (this year Milwaukee), L.A. or Dublin. Four stages, 35 bands, well over 100 players. Thanks to all of you for making 2016 a resounding success. And also to the wonderful audiences that came, you were the best! 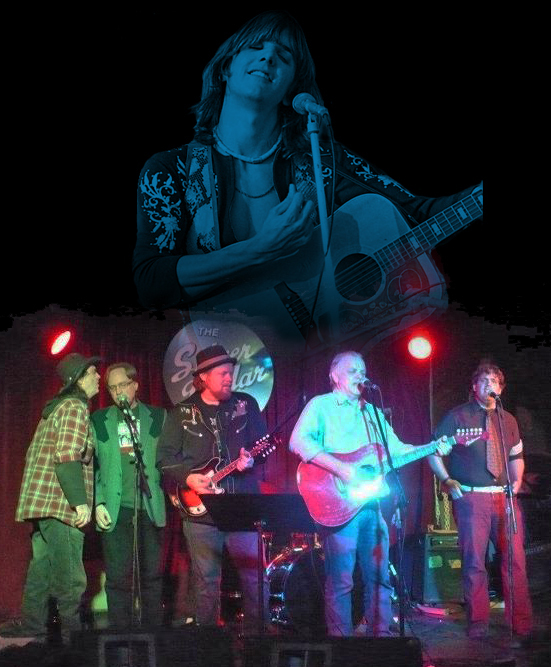 2016 marked what would have been Gram Parsons’ 70th Birthday, and just like we did for his 65th, we took the show on the road and presented his 70th Birthday Bash. We honor what amazing music Gram left us, and will always mourn what might have been… but Gram would have wanted us to celebrate, and that is our foremost intention. Gram Parsons InterNational, aka Cosmic American Productions, is one of the foremost Gram Parsons celebration festivals in the world, and the only one that travels to the fans and the musicians! Check out the slide show covering 124 pictures at random over the past eight years while listening to three Gram Parsons songs from the ISB, the FBB, and Gram/Emmylou. 2015. Last year this month (March) I was down in Winter Haven, FL, consulting with Main Street Director Anita Strang on restoring/re-opening Gram Parsons’ first performance space (that he owned), The Derry Down. Most of 2014 was spent supporting that effort. This year? California Dreaming Is Becoming A Reality (https://www.facebook.com/events/1613085462262352). Yep, all those cats out there that really turned country into “country rock” (or whatever you or Gram prefer to call it), and the Bakersfield sound that informed the movement, need to be recognized, and we intend to do it. To review: Gram Parsons InterNational (GPI) concert tour is not about re-living the past, but about celebrating it with the new as informed by Gram’s legacy. Especially in regard to Gram Parsons and the California sound. We are on our eighth annual in Nashville, fourth in Toronto, two in Boston, and one each Chicago and St. Louis. Each night showcases up to eight current and hot mostly regional bands in a tightly run festival situation. We honor the legacy of Gram Parsons and the birth of “country rock” not by replicated his songs (although each band interprets at least two FBB/GP songs), but by presenting bands whose sound is new but who freely admit their musical debt to Parsons. Expect to rock out to country music this year at GPI West! Get those dancing shoes on and stay tuned (also for more on GPI Nashville VIII and our fourth in Toronto). The seventh annual Gram Parsons InterNational, once again at our home in Nashville, the legendary Douglas Corner Cafe, was a resounding success. Barry Tashian, formerly of The Remains (opened for The Beatles on their final American tour), friend of Gram’s and contributor to G.P., and founding member of the original Flying Burrito Brothers) was highly entertaining with his wife Holly and the Shelby Bottom String Band. Phil Kaufman was a big hit as our a special guest, doing a meet and greet in back. Other bands and artists were all wonderful, including: The Tangled Hearts, Ron Dometrovich from Birmingham Alabama, Don Pedigo, Donna Frost and her band, Jacques & the Valdanes and Ray Harris and the BSOBs from Ontario, Canada, Bobby Dove from Montreal, Jerry Mincey from Winter Haven, FL, Billy Ray Herrin from Waycross, GA, The Carmonas, Mac Leaphart, Ben de la Cour, Sin City Boy Larry Sepulvado from Houston with his son (New West Records) backed by former members of The Jordanaires (including the legendary Ray Walker, Jr.), Tokyo Rosenthal, The Gram Band, and The Chris Watts Band. The 2014 event page: http://gram2014.us. Gram Parsons InterNational’s sixth year in Nashville was glorious. Two full nights of bands and singer songwriters, all solidly in the legacy of this group’s namesake on the 40th year of his passing. Along with Gram Parsons covers, an extraordinary level of individual and group talent was displayed. This after that Wednesday’s wonderful Gram Parsons InterNational 10 x 3 Cleveland, hosted by Brent Kirby at Brothers Lounge, with just a travel day between. I was lucky to have my daughter Kira Meade in tow for a second year, so between us we captured quite a bit of video clips. Last year I built a page here to display them. This year I began one, then realized how much easier if would be to just link to my Gram InterNational YouTube channel, rather than all that copy and pasting embed code. Additionally, video from our Toronto show this year resides on the same page, as well as past shows from Boston and Chicago. Of course it’s still all for the cause of inducting Gram Parsons into the Country Music Hall of Fame. As Tommy Hall demonstrates here, they left an empty spot next to Emmylou’s plaque all set for his! http://gramparsonspetition.com, over 12,000 signers so far. What is Gram Parsons InterNational? Well, it’s an annual international festival to recognize the genre-bending musical contributions of a man who died 40 years ago this year but who seems to have more fans with each new generation. He’s consistently listed in Rolling Stones’ “100 Greatest Artists of All Time” but one of only a handful on that list not in the Rock and Roll Hall of Fame. He died 40 years ago this year (2013) but made cover stories in two of the premiere music magazines first thing this year (Uncut and Mojo). He has had more books written about him than just about any person in history who died by age 26. And there is a petition to induct him into the Country Music Hall of Fame with over 13,000 signatures and comments so far from ardent fans and supporters around the world. The answer: Cecil Ingram Connor III, better known as Gram Parsons. 2013 marks 40 years since his first solo album release (GP), and his death and posthumous release of his final masterpiece Grievous Angel. Gram Parsons InterNational is not labeled a “tribute” concert in that, while you’ll hear plenty of Gram’s songs, bands are chosen that are judged to be in the legacy of this seminal artist and what he was trying to do, and bands are considered that have followed in his footsteps. All that sounds a bit arcane. There is nothing arcane about a Gram Parsons InterNational. It’s one of the biggest parties of the year. We are often a Critic’s Pick in Nashville (tough competition every year! ); and we’ve received nothing but glowing reviews and comments in every city that has been so gracious to host our events. On the long drive home from Nashville (2011), the year Gram would have turned 65, with the endless November landscape of Ohio rushing by me, and perhaps a few truckers, kickers and cowboy angels, I began thinking about how much I’ve learned from the past four years, and especially the three one-night festivals I organized and managed within a couple months this fall in Toronto, Boston and Music City USA. I also began to think about all the good though similar questions asked from bands, fans and venues. By the time I was skirting Cleveland, I decided it was time to put it all together in one place, especially for bands interested in playing and for venues to clarify the concept and what’s involved (and not involved) in such a one-night festival, and discuss needs and expectations from both sides. That is now the Want to Play page here; all interested performers should read it. Gram Parsons InterNational V (2012), Nashville’s fifth consecutive annual festival commemorating Gram Parsons and the Petition to Induct him into the Country Music Hall of Fame, was a tremendous success. Bands included: James Scott Bullard & the Late Night Sweethearts w/ guest vocalist Rebecca Morning, Harmondale, The Burritos w/ Walter Egan, Casey James Prestwood & the Burning Angels, Donna Frost, Rich Mahan & the Cocktail Heroes, The Devious Angels, Chris James & The Gram Band, and special guest Bob Buchanan, Gram’s bandmate with the International Submarine Band and co-author with Gram of “Hickory Wind.” Jock Bartley of Gram’s Fallen Angels tour and guitarist for Firefall was there and gave us quite a show. Author Bob Kealing’s new book “Calling Me Home: Gram Parsons and the Roots of Country Rock” provided the theme of the show. The title of that book was also the theme of 2012’s Gram Parsons InterNationals. Performers at Gram Parsons InterNational VI Nashville: included Jock Bartley (Firefall, Gram’s Fallen Angels) w/ his band inc. Rick Shell, ex of Pure Prairie League), The Burrito Brothers, Brigitte DeMeyer, Zach Ryan & the Renegades, Walter Egan, Donna Frost, The Devious Angels, Ray Harris & the BSOBs, Jon Byrd, Don Pedigo, Rich Mahan & the Cocktail Heroes, Charlie Pate & Friends, Aaron Raitiere, Trevor McSpadden, Jerry Mincey (childhood friend of Gram’s and Florida singer/songwriter), and B.J. O’Malley. to take a look when I get home. I’m amazed at how quick your blog loaded on my phone .. I’m not even using WIFI, just 3G . Will you should write a book on Gram!! !